Home / Visit Sunbird at Datacenter Forum Helsinki! 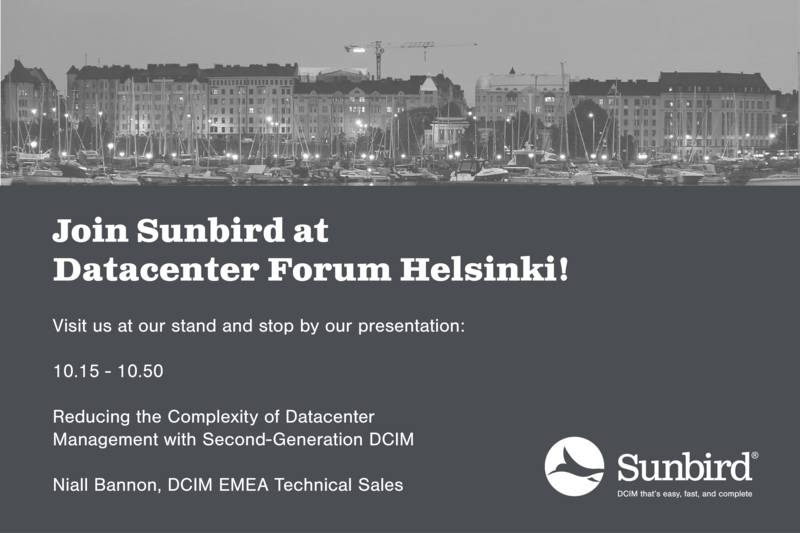 Visit Sunbird at Datacenter Forum Helsinki! Sunbird will be at Datacenter Forum in Helsinki on April 26 at the Crowne Plaza Hotel. Stop by Stand 4 for a demonstration of our award-winning second-generation DCIM software. You don't want to miss Niall Bannon, DCIM Technical Sales EMEA, present "Reducing the Complexity of Datacenter Management with Second-Generation DCIM" at 10:15. Learn how you can modernize your operations to tackle the challenges of modern data centers. If you're involved with the managing and operations of your organization's IT infrastructure, register for free to join 200 of your colleagues from the data center sector in Finland and the Baltics. Heading to Datacenter Forum and want to chat one-on-one with a DCIM expert? Sunbird representatives also will be available for individual meetings. Let us know if you’d like to meet.